Ariane's life is complicated. Her mother suddenly disappeared two and a half years ago, she's trying to get used to living with her aunt after bouncing around a series of foster homes, and she's taking a lot of grief from the clique of "in" girls at school. To make matters even worse, now she's having strange dreams involving swords and knights and battles, and things seem to get weird whenever she touches water. The weirdness comes to a head the morning the lake starts singing to her. Next thing she knows, she's underwater, talking to the Lady of the Lake of King Arthur fame (who turns out to be an ancestor), has acquired a nerdy sidekick, Wally, has been bestowed magical powers, and has been sent on a quest to find the five scattered shards of Excalibur before the powerful wizard Merlin, in his unsuspected modern-day guise, can get his hands on them. Can Ariane and Wally figure out how to use her new abilities to meet the challenge...or will they die trying? A story that plays in the fantastical realm of Camelot always grabs my attention. The great thing about this story is that it uses just enough of the Camelot mythology to ground the reader, but then it takes off on a completely new adventure of its own. The teenage leads of the story, Ariane and Wally, certainly don't have idyllic lives. I think that's what made them feel very real to me, and why I was drawn into the adventure right along with them, because who doesn't remember a time when it felt like no one understood you and everyone was against you? The fantastic abilities Ariane acquires partway through the story were a delightful surprise, and led to all sorts of unexpected twists and turns. So much happens to her and Wally that I almost felt exhausted when I reached the end of their adventures. And this is only the beginning of the quest! Elizabeth Klett does a great job of voicing the various characters as they navigate through the events of the book. Her narration sucked me right into the story - it was as if I was there standing on the street or off in the corner of the room watching the characters lives unfold in front of me. I had actually read the book before listening to it in audio form, and I have to say that I prefer the audio book, which is entirely due to Ms Klett's performance. You don't have to be a teenager to enjoy this book, you just have to love a great adventure. Great adventure so far. I really want to check out the other books in the series.it gets you hooked and wanting more. 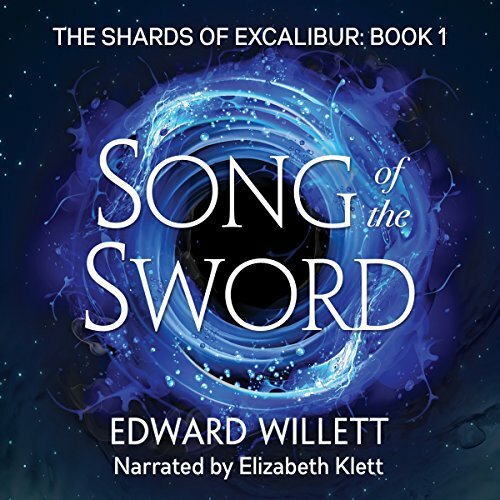 Turn the lights out, put the ear buds in, and sit back and let the soothing voice of Elizabeth Klett bring Edward Willett’s first book in the Shards of Excalibur series “Song of the Sword” to life. It’s a fantastic start to a story that will please people of all ages. Klett gives voice to the characters and brings them to life vividly in a way that I’ve never heard before. It is a must read for any fantasy lover, or if you just like a good story. Great arthurian tale. The king of this is still the once and future king but this story is still good. I actually prefer the narration for these tales to the ones on audible currently. Very cool idea! Ariane and Wally are great characters in a wild and fantastical world, with King Arthur, the Lady in the Lake and Camelot thrown in. Very creative and fun book, really enjoyed it!! What an adventure. Well written and well narrated - I enjoyed it from start to finish and now am excited to move onto Book 2. I definitely recommend this to anyone, it's a joy to listen to! Song of the Sword is a wonderfully written story that takes elements from Arthurian Legend. Ariane is sent on a quest to retrieve the shards of Excalibur before Merlin can claim them and return to power. As she discovers the powers bestowed upon her by her ancestor, The Lady of the Lake, the challenge becomes very real and dangerous. This is a great start to a new series, and I look forward to seeing where it goes! It is young adult and reminiscent of Percy Jackson stories by Rick Riordan. It’s not an intense story but a fun one. Together with a kid from her school, Ariane has been set on the quest to find the five shards of Excalibur. Merlin, diminished in magic, has been attempting to recover them for himself. We get hints there might be more to the story portrayed by the Lady of the Lake. Is the line a bit fuzzy between the seemingly evil and well-intentioned? Guess we need to find out in the next book(s). This is not a stand-alone novel. I never rant, but seriously reviewers....why can’t Merlin be in Canada? What’s wrong with everyone else? Do you realize how many Brits have populated Canada? If Percy Jackson and the Lightening Thief happened in the USA not Greece, why not Canada? Not every storyline has to happen in or be solved by Americans!! Besides, give Seattle, New York or Los Angeles a break! This is the first book I’ve read/listened to by this author and I would listen to another. In fact, I have the next book in my queue. I’m looking forward to listening to more of this storyline. This is the fifth book I’ve listened to by this narrator and I would listen to another. I previously listened to the boxed set Olento Research. She gives each character a distinct voice and expression. When she narrates you are listening to someone “tell the story” not “read a book”. The story comes to life. Overall I think this story is pretty good while being pretty unique. One of the problems I think this book has is the things that don't really need to have extra descriptions about do and things that should have more don't seem to have enough.